Following a successful campaign in South Carolina Cornwallis entered North Carolina in an effort to bring the Revolution to an end in the South. However, poor supply and communications weakened his army as he sought to bring the rebels under General Greene to battle. Eventually Cornwallis would get his wish at Guilford Courthouse. Guilford Courthouse saw Virginian and Carolinian militia, stiffened by Continental Line regiments, fight British regulars, German mercenaries and loyalists. They may not have won but General Greene made the best use of the men he had and managed to inflict such heavy casualties that Cornwallis had to retreat to Wilmington to reestablish and refit his men, ceding the fight for the Carolinas to Greene. 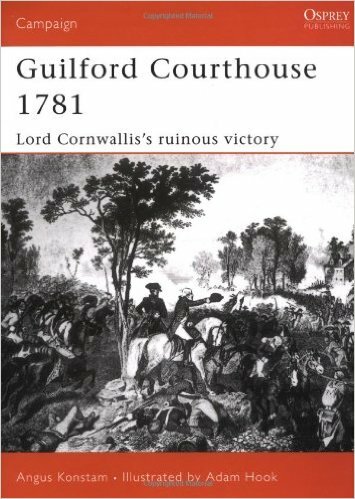 This is an excellent book detailing the fight at Guilford Courthouse. I recently walked along the battlefield park there and I am glad that I got this book to put this battle in context. It is well-illustrated and well-written.